Having enough room to have company stay the night is a nice thing, but keeping an entire spare bedroom handy for that cause isn't always a very practical idea. Depending on how much space you have to work with, a guest bedroom can mean the difference between having an extra room to enjoy fun hobbies and having to enjoy those hobbies in the kitchen or some other inconvenient place. Unless you have guests over a few times per week, a guest bedroom probably isn't the best idea in the world. 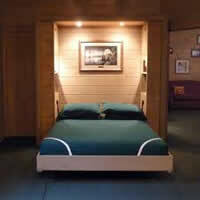 Wall beds, however, allow you to enjoy the best of both worlds. Murphy wall beds allow you to transform your spare bedroom into a hobby room, reading room or a sawing room whilst still having access to a great bed for guests to sleep on. Do You Really Need A Guest Bedroom? Generally guests will not plan on spending a significant amount of time in their bedroom. In fact, they'll probably strictly use that room to get some sleep and will spend the rest of their time out in the common areas of your home. So what is the purpose for dedicating an entire room to a guest bedroom when it could be enjoyed for something more useful? The practicality of setting aside an entire room that will only be used infrequently just isn't very high. Thanks to the stunning examples of wall beds available today, it's easy to create a hobby room - like an art studio, a sewing room or a study - that boasts shelves that fold out into a comfortable bed for guests to sleep on. By day, this room will serve as an oasis for you and others in the home to enjoy various hobbies - it could even serve as a kids' play room - but by night the bed can be folded down and enjoyed by guests whenever necessary. Compared with creating a largely unusable guest room, this is a very viable option indeed. While sofa beds are another option that many people consider, it's important to note that the fold-out nature of such contraptions renders them quite uncomfortable. 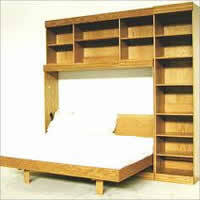 One thing's for sure: Murphy wall beds are wonderfully comfortable. Your guests won't be relegated to an uncomfortable pull out bed, but will get to sleep in ergonomic comfort while visiting you. When they leave, simply fold the wall bed back up and arrange the shelves or whatever other configuration you've chosen back into proper order. In effect, you'll enjoy at least two rooms in one - and you'll always be prepared to have guests stay the night.